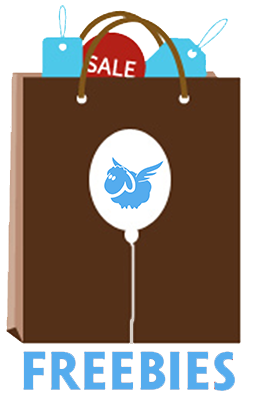 Are you planning a couple trip to celebrate a special occasion – an anniversary or your loved one’s birthday? 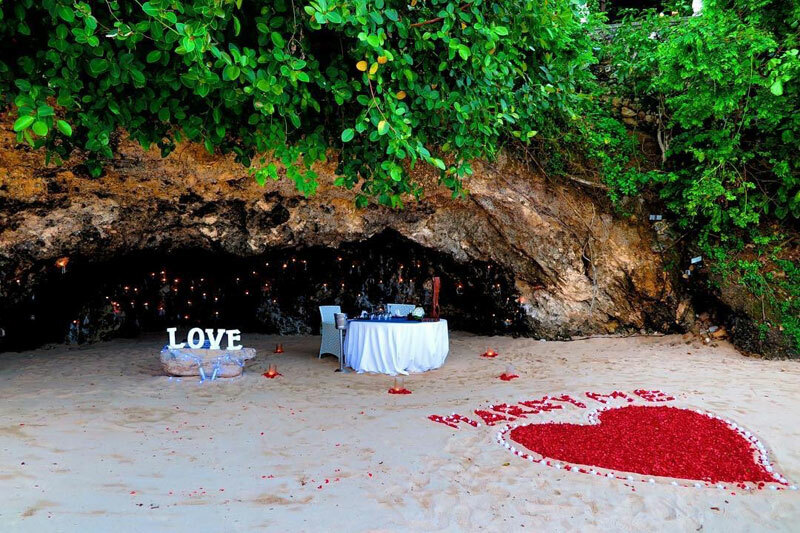 If you are, what’s a romantic getaway without a private fine dining experience to commemorate that special day? 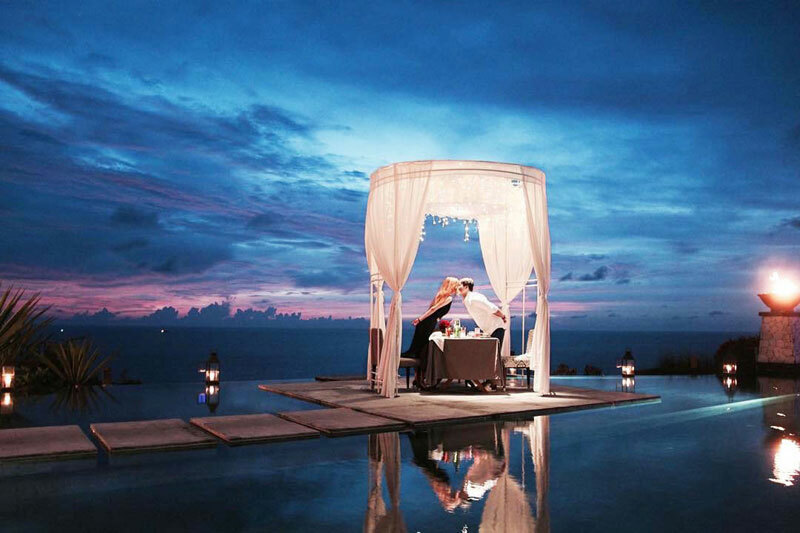 Imagine having a candlelit private dinner under the twinkling stars, serenaded by the soothing music of the ocean. And best of all – there’s only just two of you, surrounded by no one else but nature. So what are you waiting for? 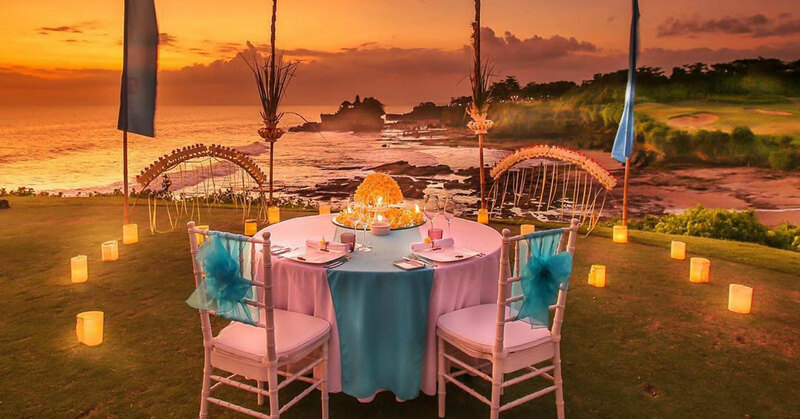 Check out these extraordinary private fine dining venues that will guarantee you and your loved one wonderful memories of your holiday in Bali. 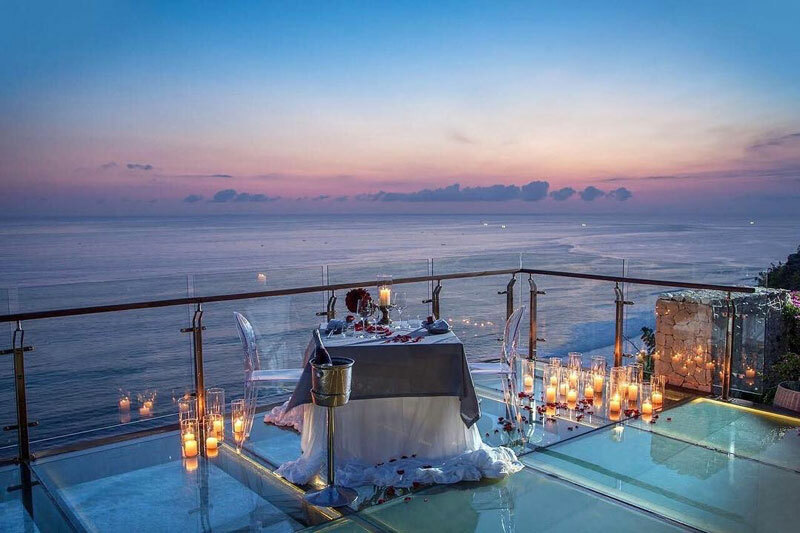 A private dining table on top of the Uluwatu clifftop will make you feel like the King of the world. 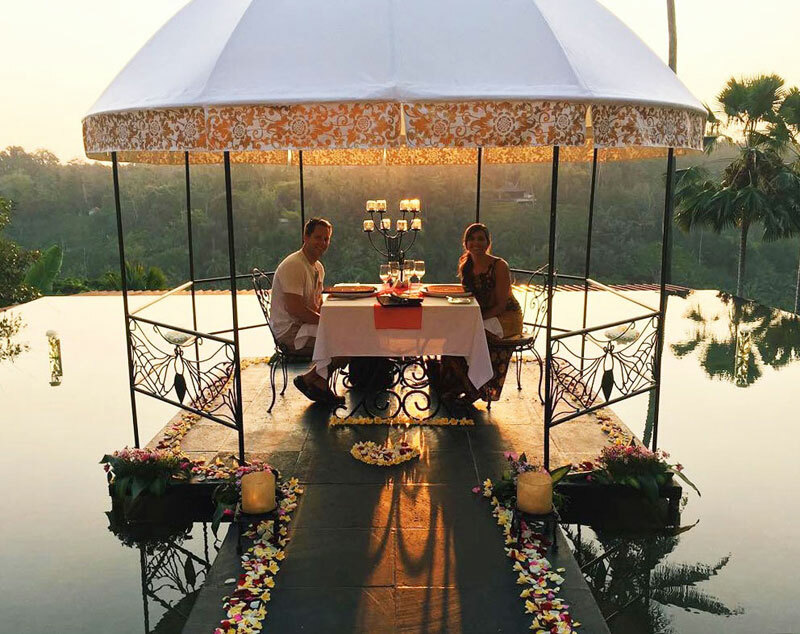 Tirtha Dining specialises in magical romantic dining experiences, and it’s the finishing touches that make this so special. Imagine dining on a floating platform, with the scent of frangipani from the surrounding gardens and the gentle lull of the waves below. You need to tear yourself away from the views for long enough to enjoy your gourmet meal. 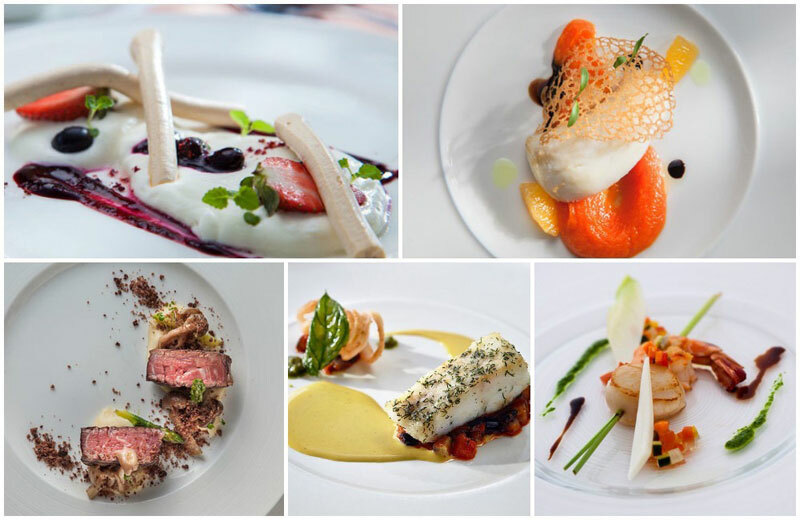 Delicious five to seven-course menus give plenty of variety to satisfy every palate. Order a personalised cake or bouquet of flowers as the crowning jewel of this dining experience. 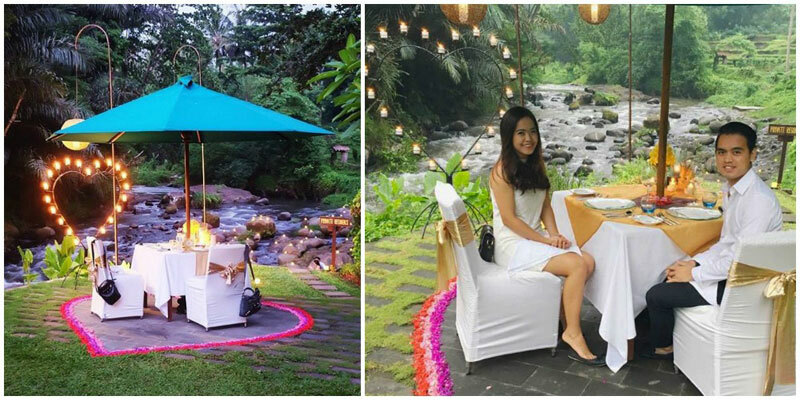 Imagine you and your sweetheart are dining in the heart of the jungle, right by the serene Ayung River of Payangan Bali. And there’s no one else around. 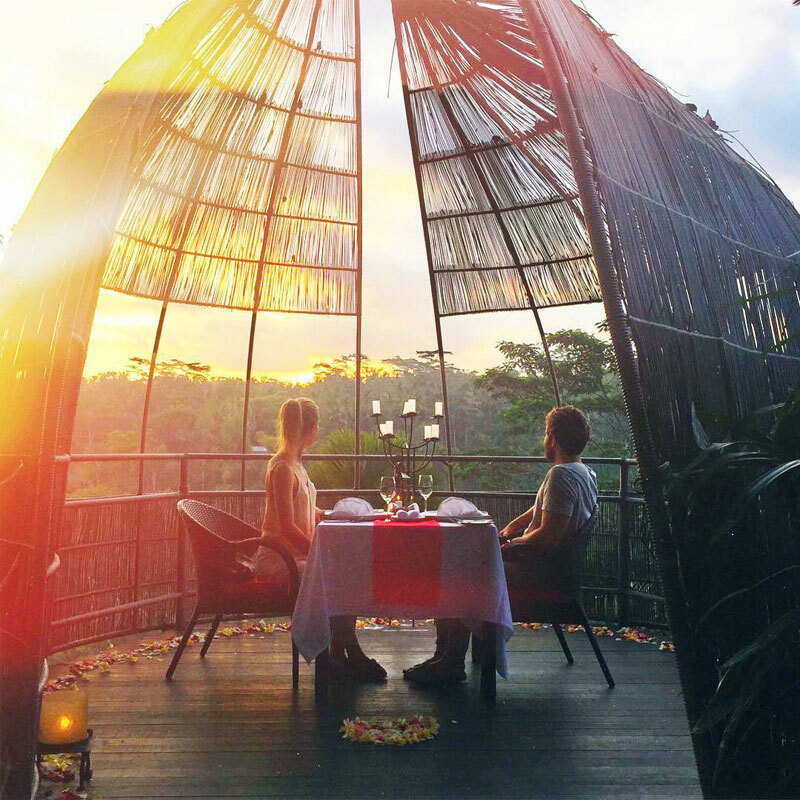 Away from all modern distractions is the gorgeous and romantic Bale Bengong – a secluded location set within the secluded courtyard of Alila Ubud. 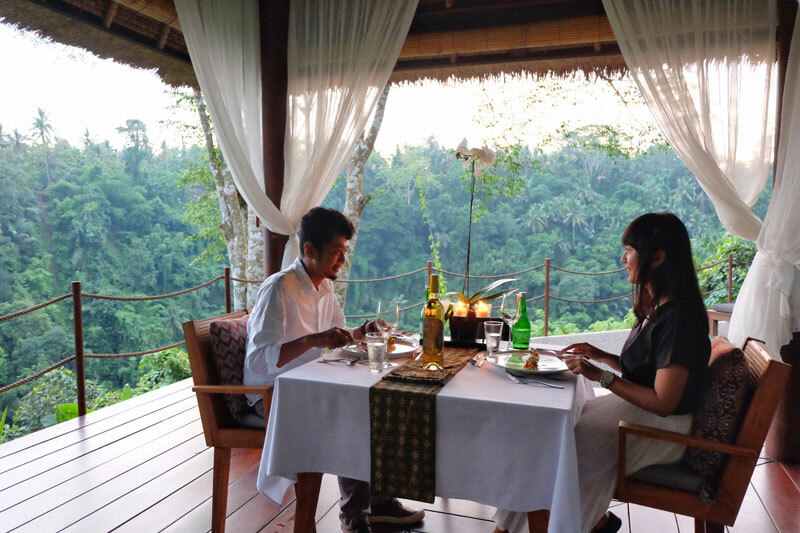 This exclusive private dining experience for two is also aptly named ‘Amidst the Forest’. 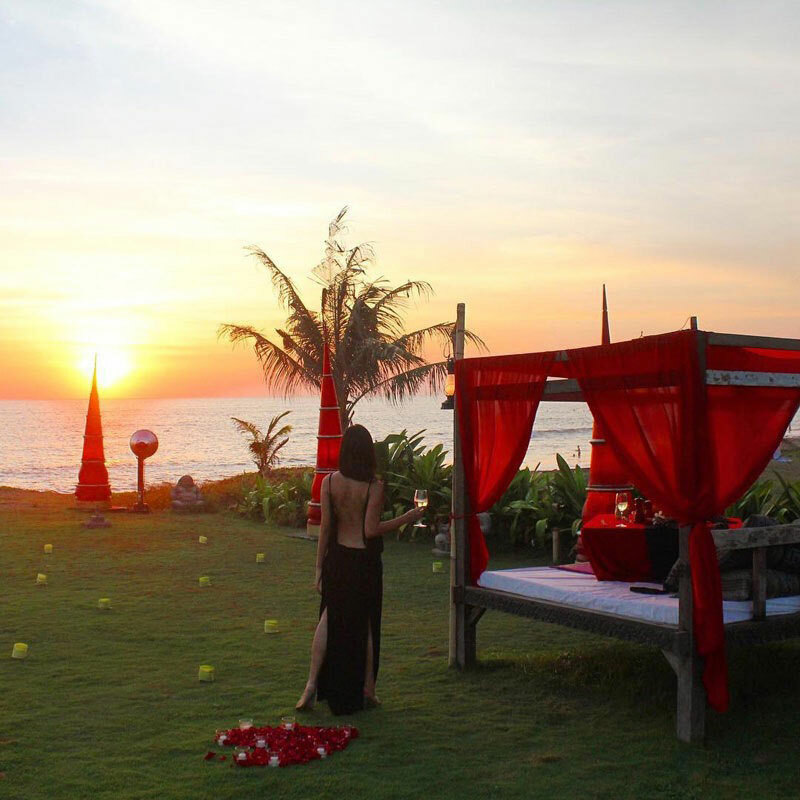 Just as the name suggests, Bale Bengong is the perfect relaxing open-air cabana complete with a traditional straw hut and soft-colored drapes. This is where you get to enjoy your meal while cozying up to each other with just the company of lush greenery around you. 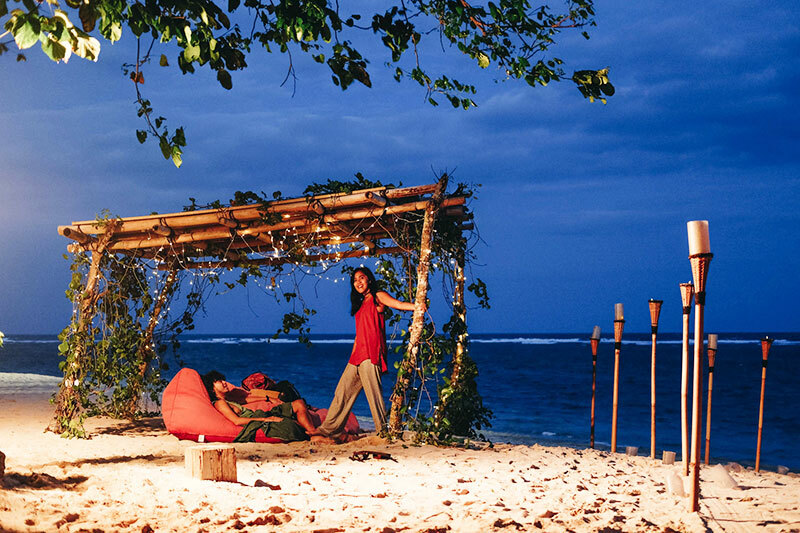 If that doesn’t spoil you enough, Bale Bengong also comes with a couple-sized daybed with plush cushions. 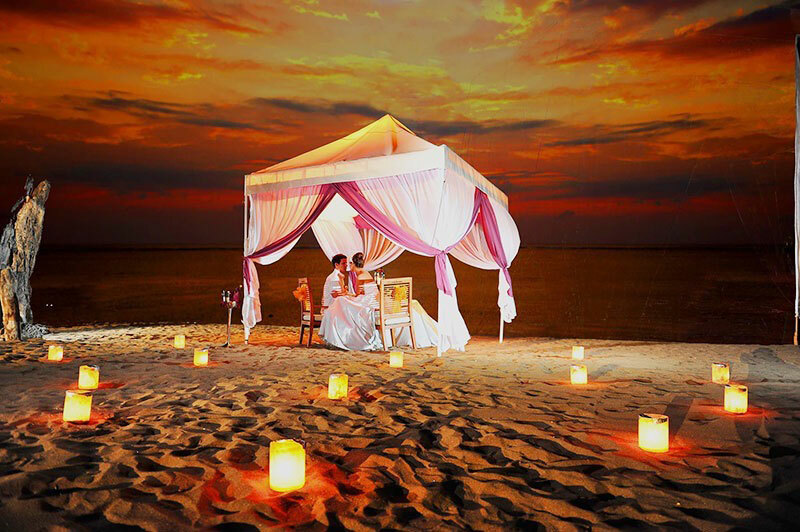 The final touch is a row of lanterns to further mark your love sanctuary for two. Throughout your meal, you will be served by a personal butler, so you can be assured that you will be well-attended to, yet have the privacy you want at the same time. You can choose from either a Western or Indonesian menu. 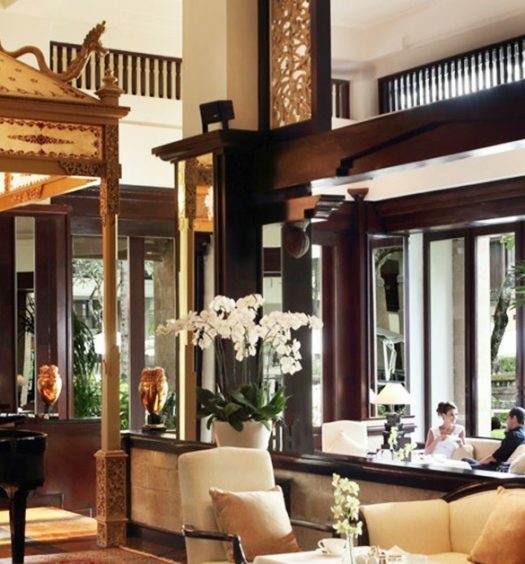 The Western options start with pan-seared scallop with a main course of cured duck breast, while the Indonesian cuisine starts with a sweet prawn soup, followed by a winning creation of slow roasted Ayam Betutu. A rich chocolate mousse cake or a plate of scrumptious banana fritter will be just the right dessert to end this satisfying dinner. If you would like to have an additional romantic gesture, you can request for their local musicians to serenade you with rindik music too! 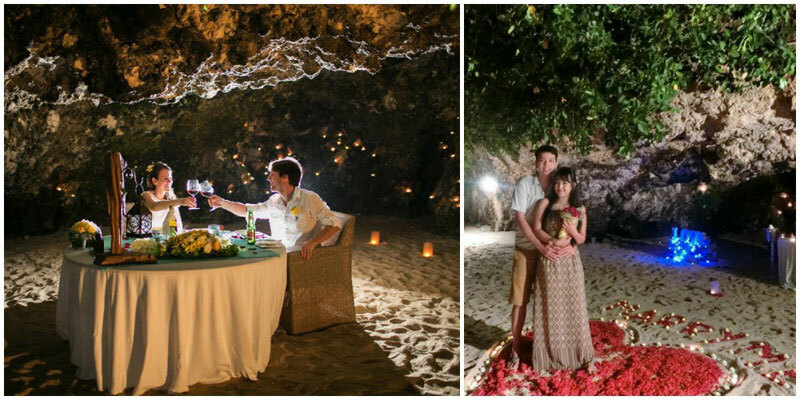 Have you ever thought of dining in a cave at a secluded private beach? You can do so at Samabe. 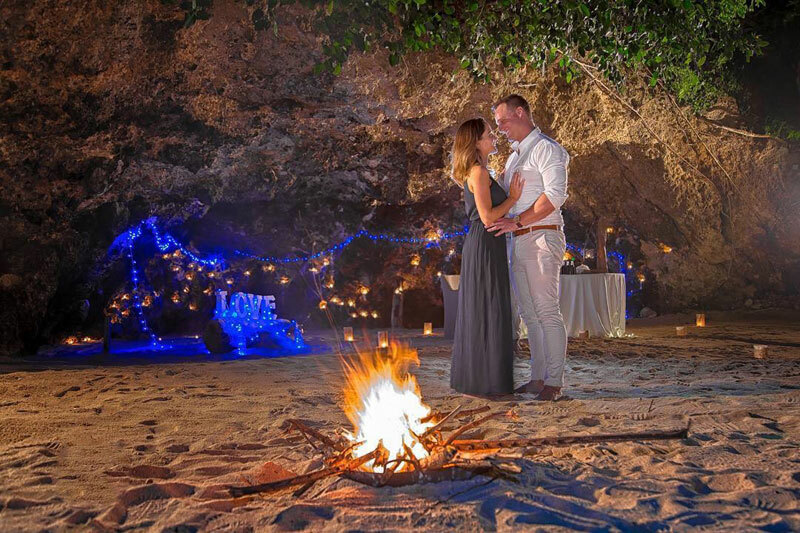 Hide from the world together with your loved one, and watch the sun set over the ocean from your secret cave hideaway – it’s an experience you’ll never forget. Dedicated chefs and waiting staff will serve a stunning five-course set menu while you relax to the sound of the waves breaking on the shore. Dinner includes specially created dishes such as a ‘Sweet Love Symphony’ – a combination of two secret recipes. 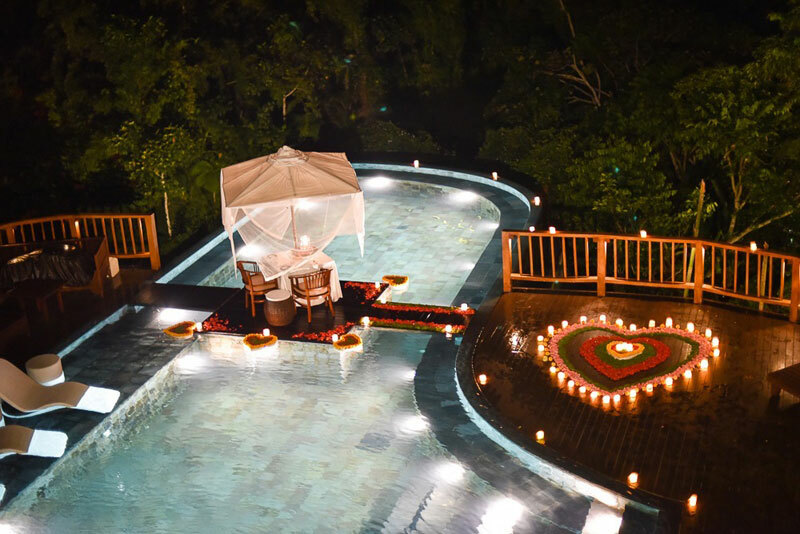 Perfect for two lovers sharing this special evening. 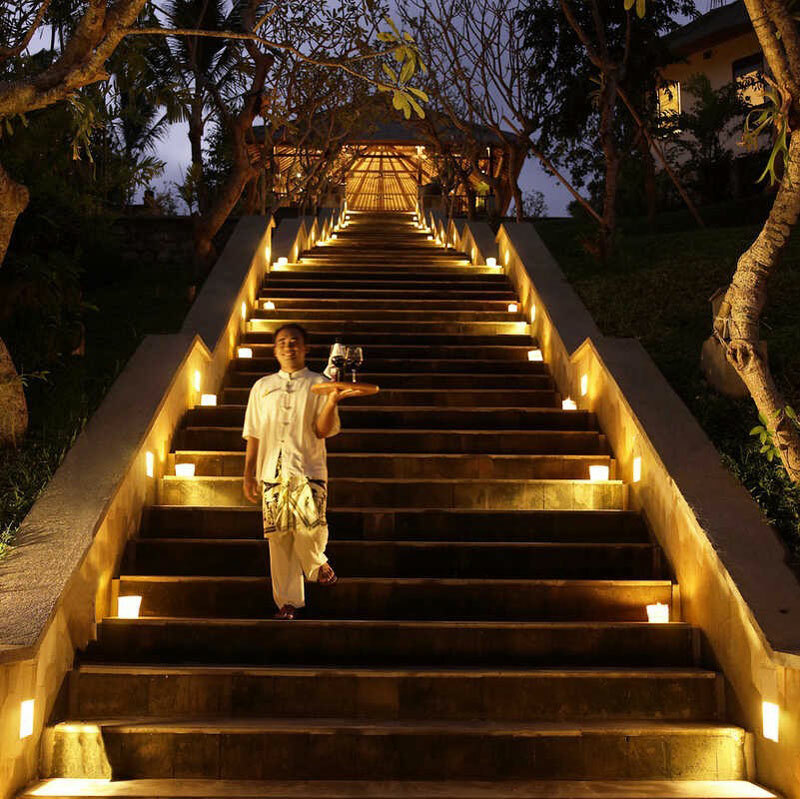 If we really can’t convince you on cave dining, the Samabe Bali Suites & Villas still boasts two fantastic restaurants. 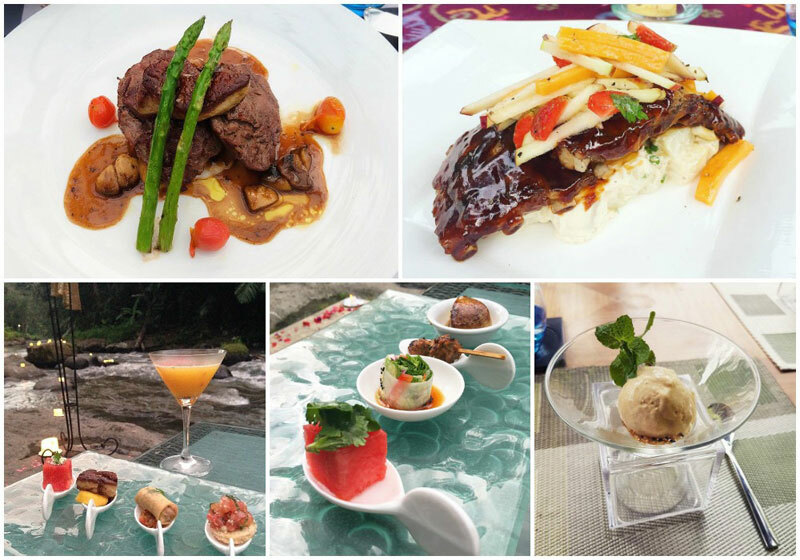 Try the Crystal Blue Ocean Grill for a relaxed al fresco setting. 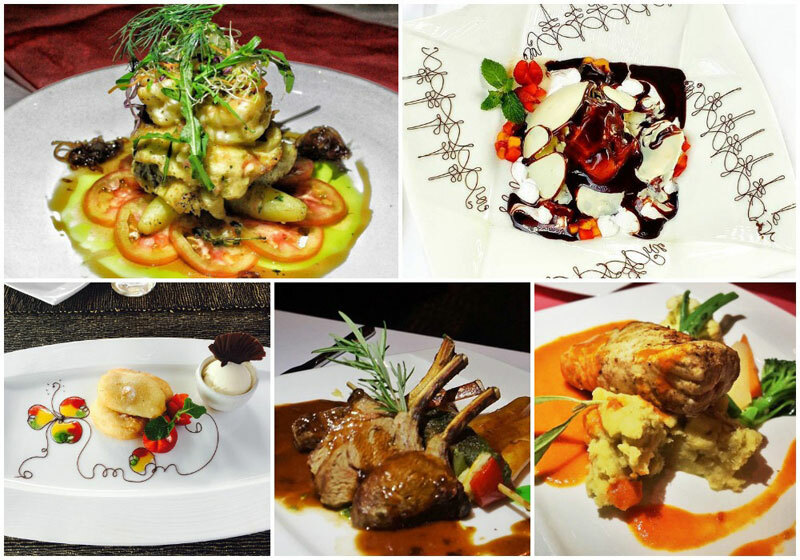 If pure luxury fine dining is what you want, Rempah Main Dining Room is perfect for you. 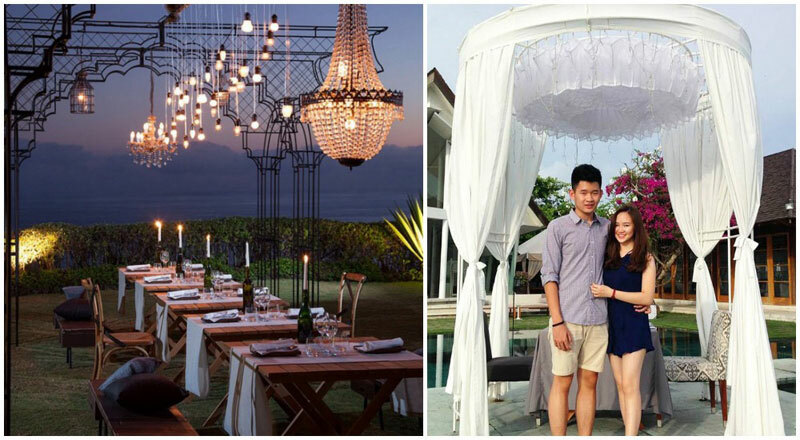 Often deemed as a must-visit for couples or honeymooners in Bali, Swept Away Restaurant is indeed a one-of-a-kind fine dining experience. 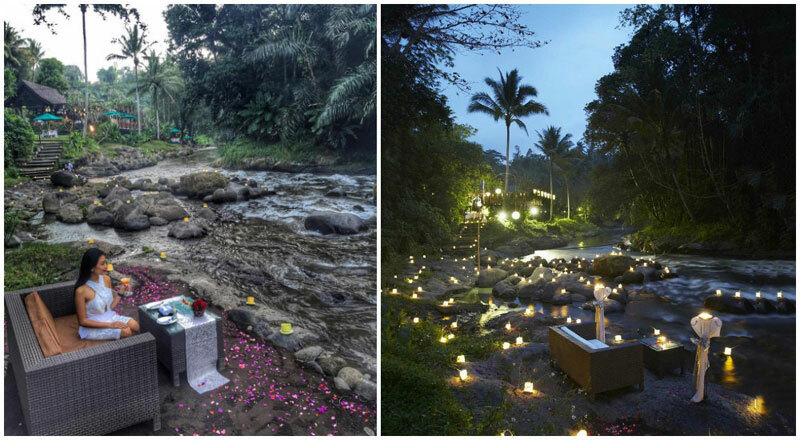 Along the Ayung river, 100 lighted candles and showers of generous flower petals are carefully placed around the river stones. 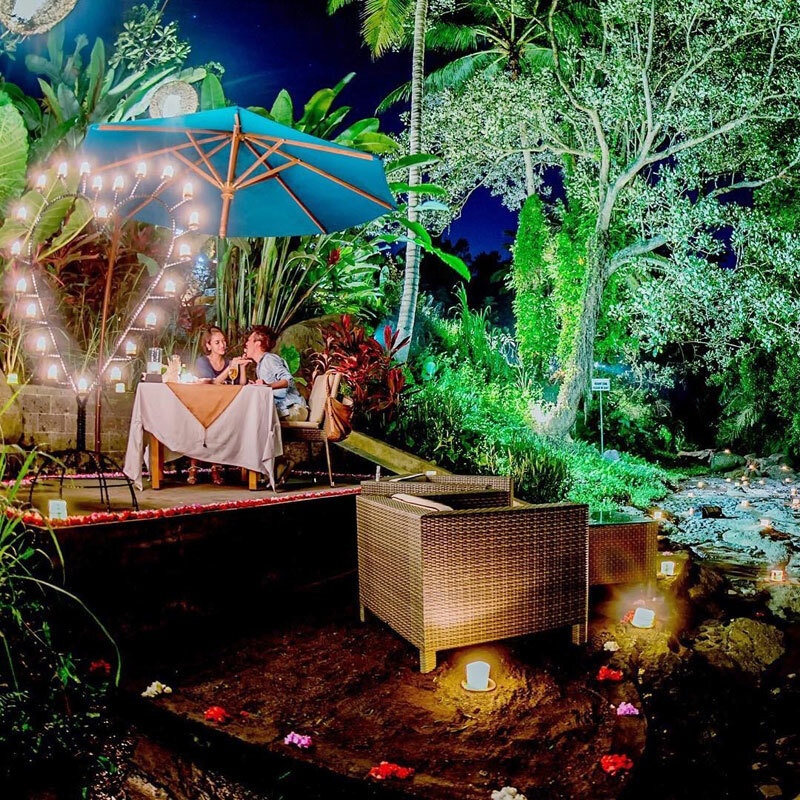 And after sunset, at the edge of the river bank, you’ll get a private love table where you can enjoy the magnificent natural atmosphere and the music of the rushing water. Your warm and hospitable private waiter will serve you with a six-course degustation or tasting menu for this special night. 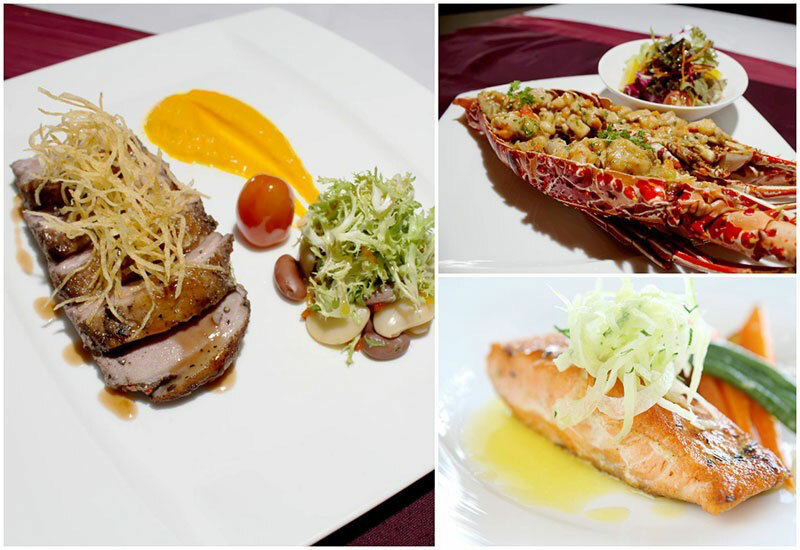 Among its favorites are the refreshing seared scallop with pomelo, the delectable chilled lobster and the Wagyu Steak that is grilled to perfection. For dessert, you get an apple pie ice-cream and apple vanilla souffle, a lovely sweet ending to your romantic dinner. 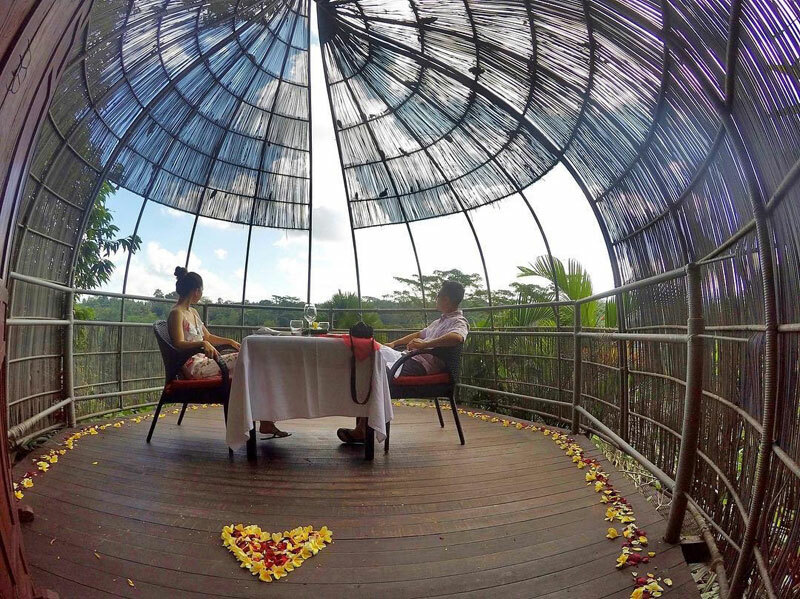 Feel at one with nature when you dine in the jungle treetops at La View private dining. 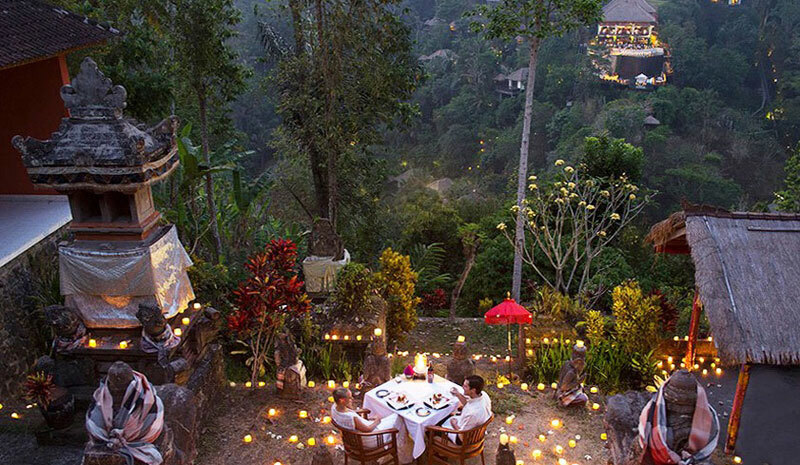 You will dine at a bamboo-encased platform perched high above the Ayung River Valley – a unique setting for your twilight meal. 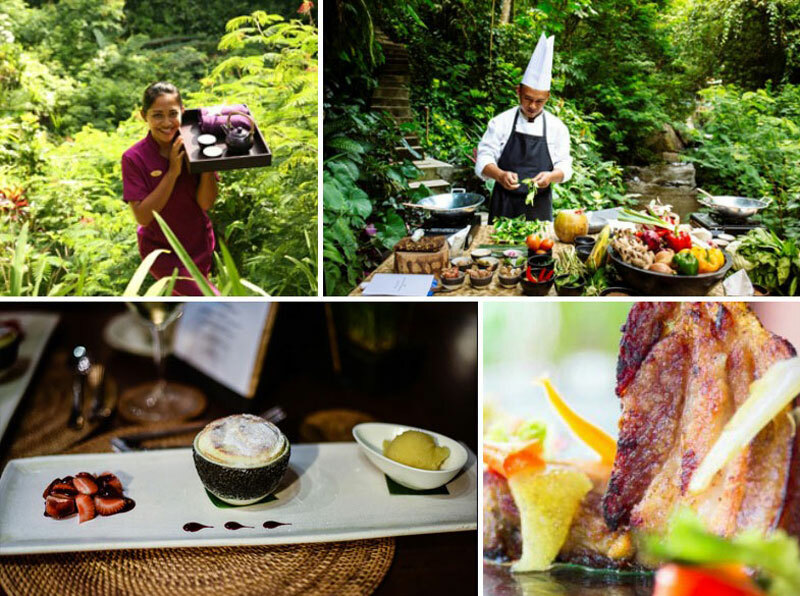 Surrounded by butterflies and birdsong, you can sample an incredible five-course menu. If you are scared of heights, don’t despair. 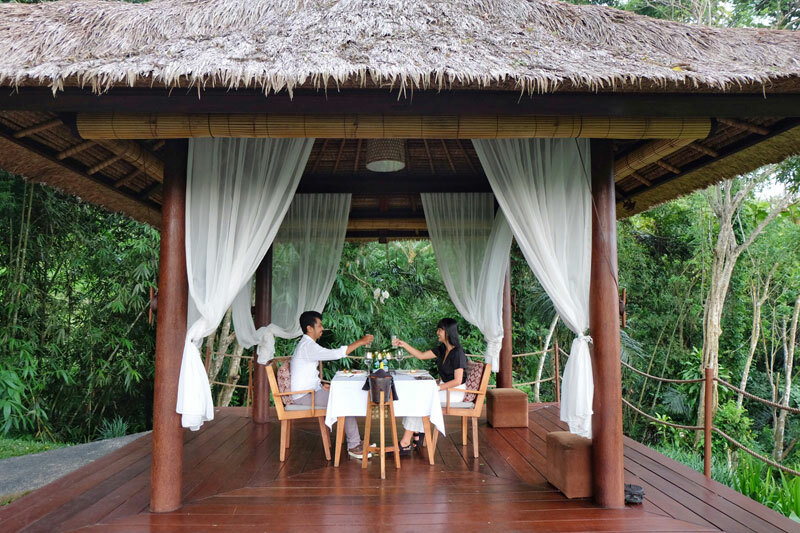 La View also offers a fabulous floating private dining experience surrounded by the jungle backdrop and fragrant flower blossoms. The only thing more impressive than the scenery is the food. If you think a real butterfly is beautiful, you should see the ones crafted by your chefs for dessert. Simply amazing! Wanna sample this awesome place but there’s too many of you to fit into the birdnest? Try La View’s stunning outdoor terrace and outstanding A La Carte menu. 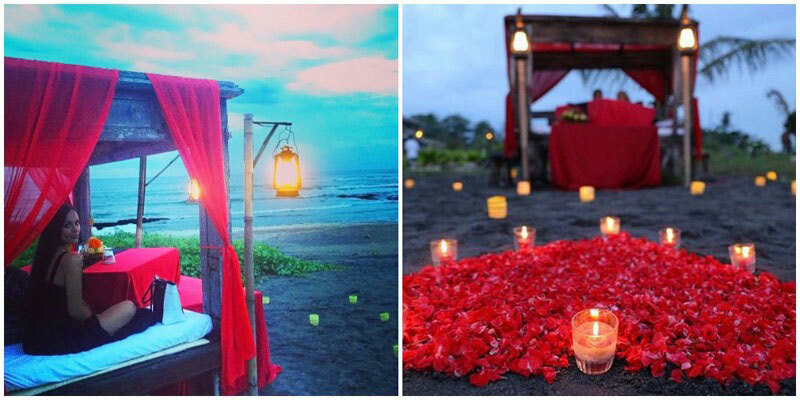 For a quaint and romantic dinner date, head down to Wantilan Agung. 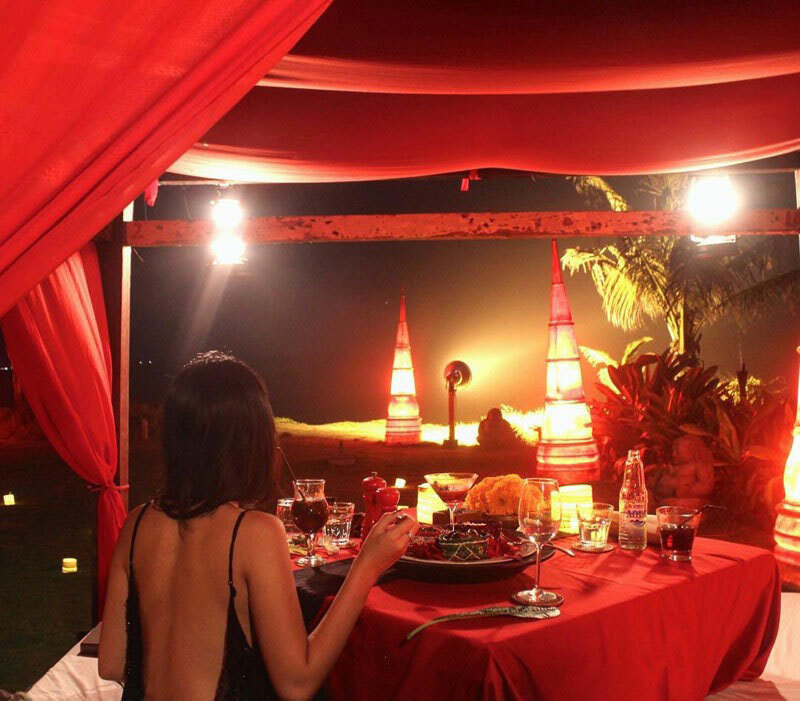 You can choose to have a private gourmet picnic under the moonlight in bed, yes, in a bed by the sea. 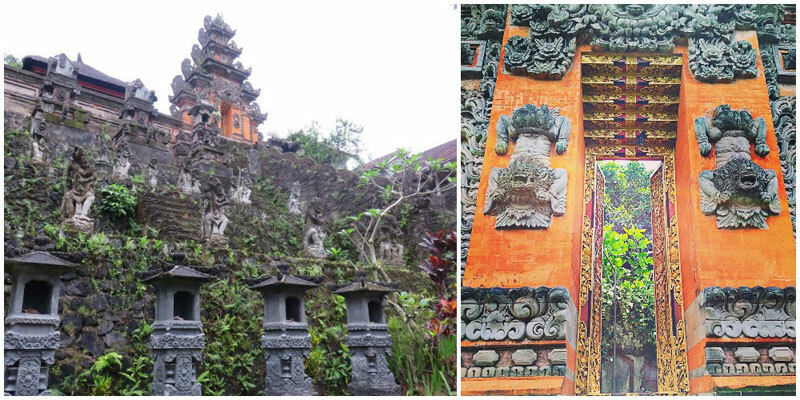 Oozing history, culture and a special indescribable something, Hotel Tugu’s fascinating ancient vibes will leave you mesmerised and falling in love all over again. 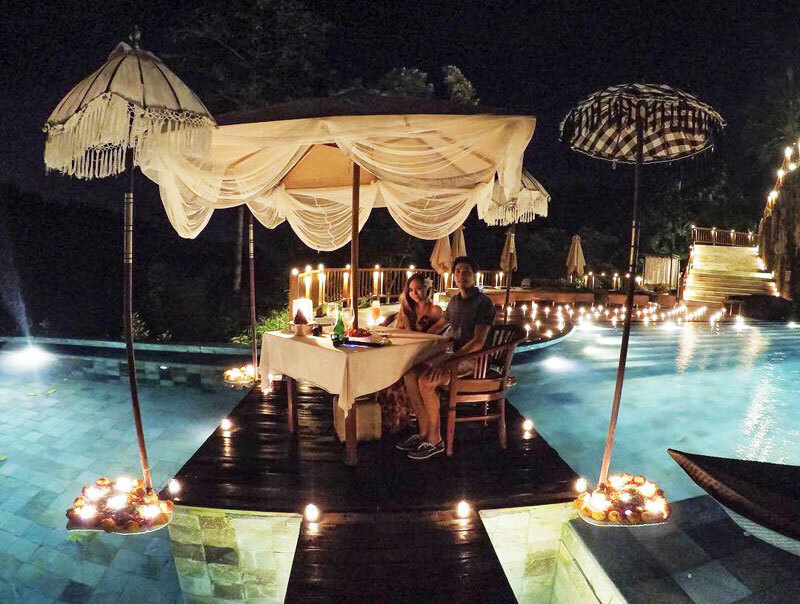 Entitled the Secret Romantic Dinner by Hanging Gardens Ubud resort, this fancy dinner takes place at the back of the Temple Segara Dalem. To reach it, guests will be guided through a path lit with only a trail of torches in the dark valley. Once you’ve arrived at the temple, be prepared to don traditional sarongs which will be provided for you, as a symbol of decency upon stepping into holy places. 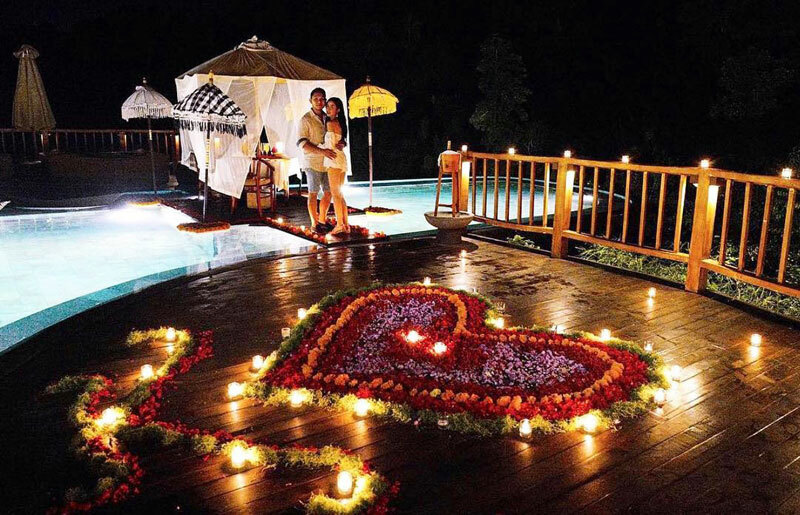 From the temple, you will get to enjoy an open view of the valley, and your four-course dinner awaits, amidst the gleaming lights of romantic torches and the gentle sounds of the Ayung river. 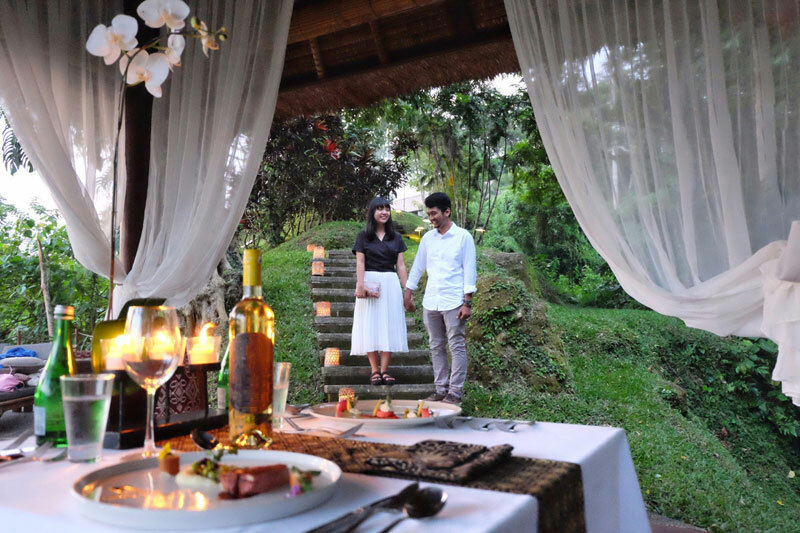 Serving authentic Indonesian favorites and choices of wine, this fine dining experience ends when the couple is escorted to meet a local priest on their way back from the temple. A solemn ceremony is carried out to offer gratitude to the deities and to bless the couple on their future journey. 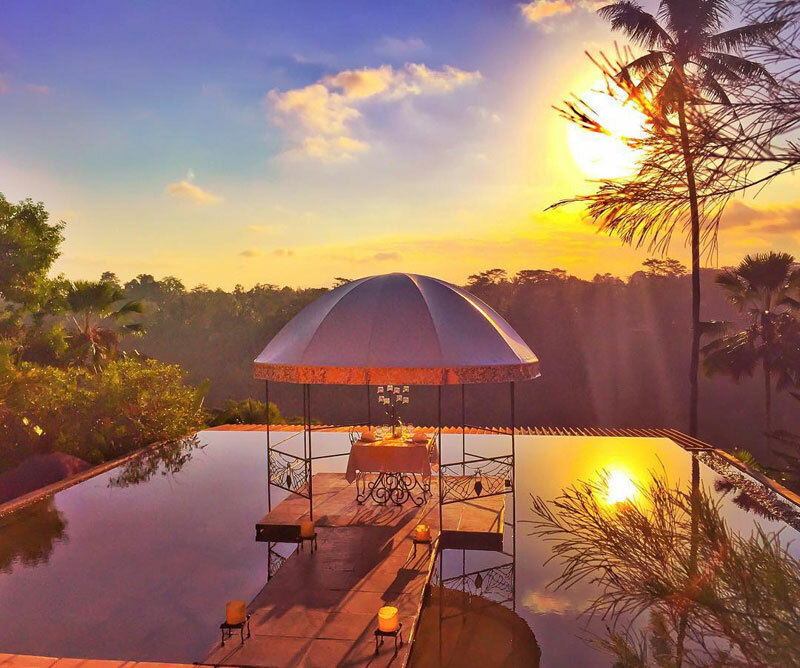 Deemed by many as one of the most romantic places in Bali, Hanging Gardens Ubud puts love on top with a prestigious infinity pool. Perched on the pool is a floating wooden path that takes you to a water bale. 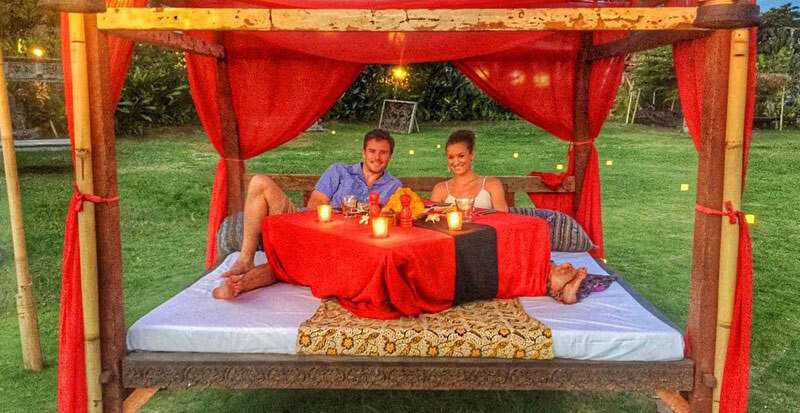 Decorated with drapes and luxurious table setting, the surrounding is just as mesmerizing with frangipani candles that light up the whole place. 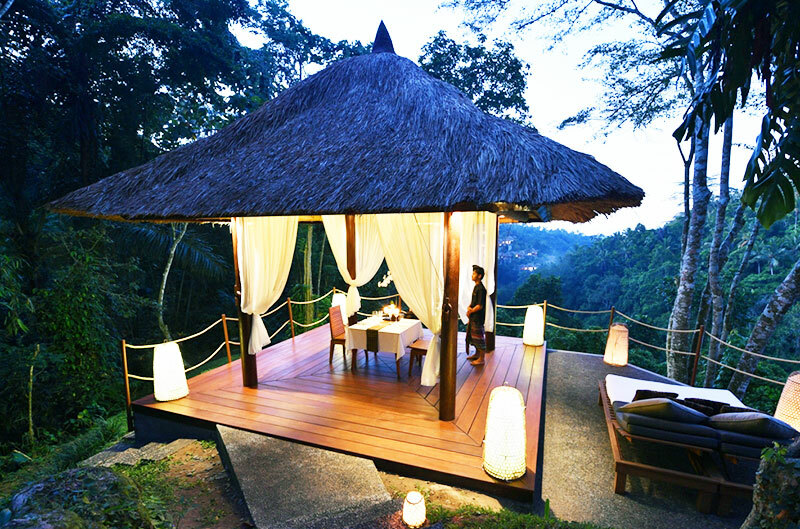 Your evening also comes alive as the smooth jungle sounds from the valley across your dining table chime in a lullaby. 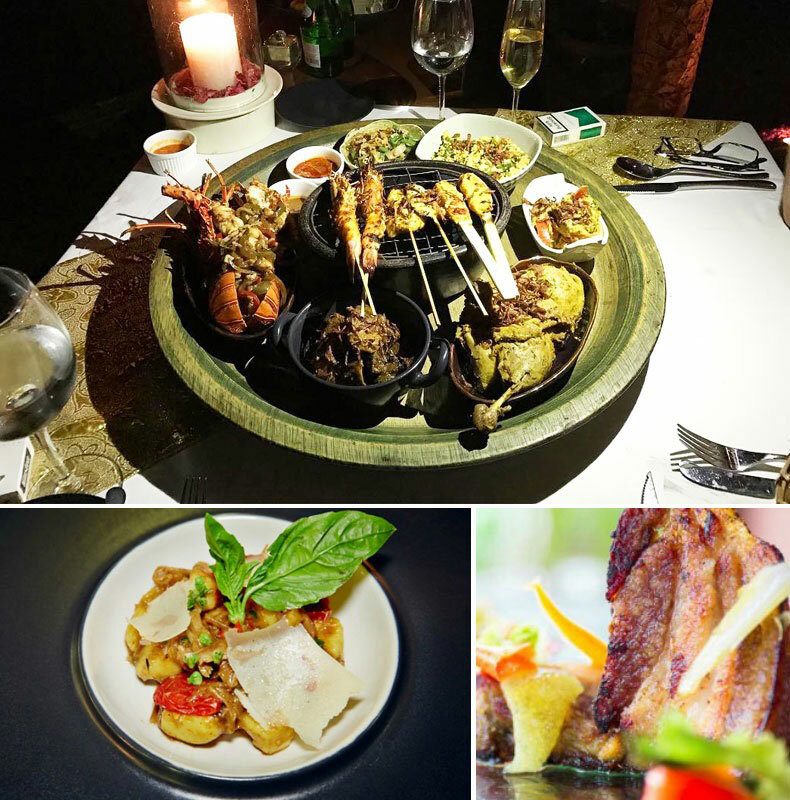 Your dinner will be prepared by a champion chef, so you can expect a range of flavoursome local cuisine and traditional courses. Of course, this also comes with an extensive wine selection and personalized service by the staff. 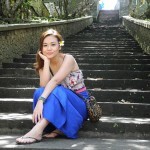 For a romantic beach getaway, head over to Kuta for a secluded slice of French paradise. Your romantic journey starts around the time of sunset and will last all night with a serving of a six-course French dinner. 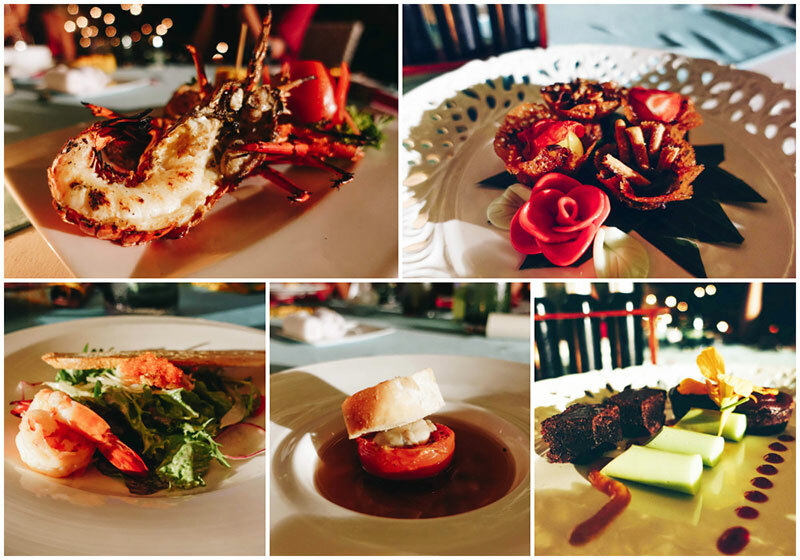 The menu includes an extensive selection of delicious seafood dishes, but don’t let all the French names intimidate you – your personal waiter will gladly recommend the best one for you. You can choose to go with the slow-cooked Tasmanian salmon or beef tenderloin, together with a bottle of wine to complement. 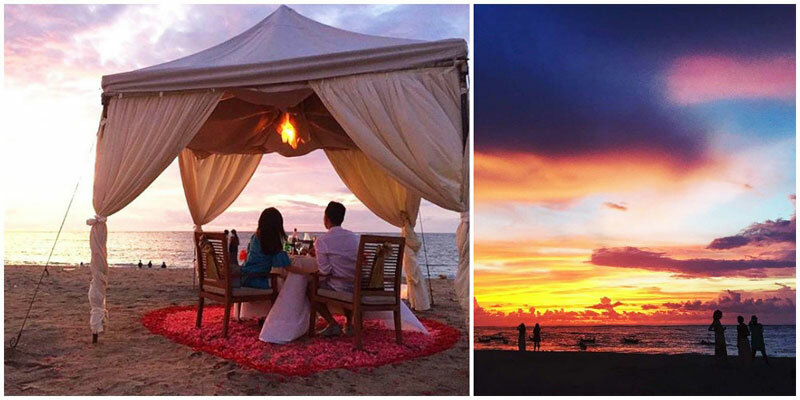 Enjoy your evening as the sky turns orange and crimson red in the horizon with your toes in the sand. With an uninterrupted ocean view and cool tropical breeze to elevate your senses, the sophisticated night is one that you won’t be able to forget, for a long time to come. Reserve a loveseat for two and watch your blissful relationship bloom as the fancy evening passes. 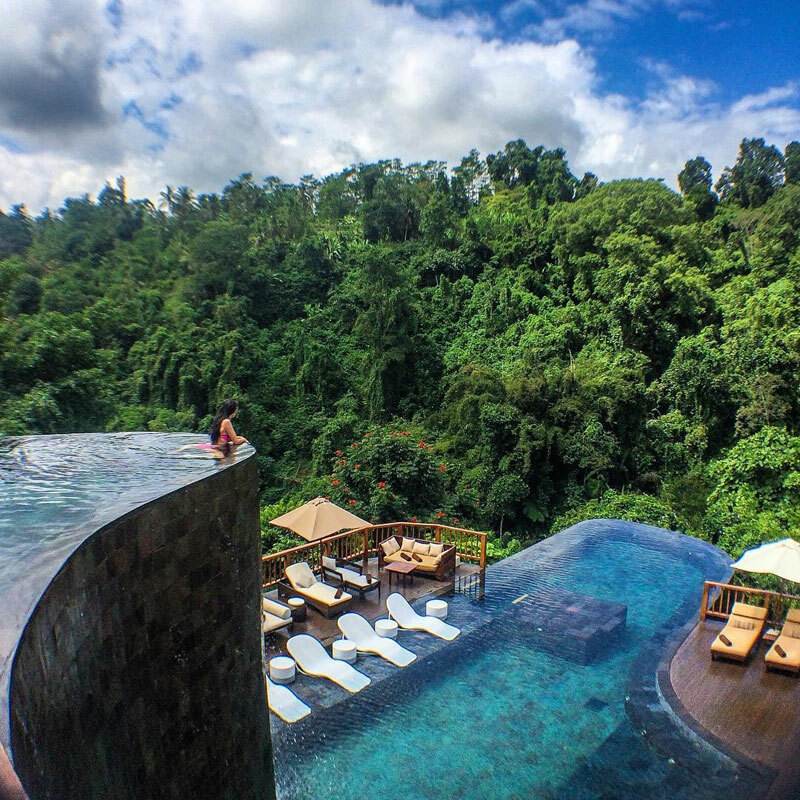 These beautiful paradise spots are just the perfect witnesses for that.